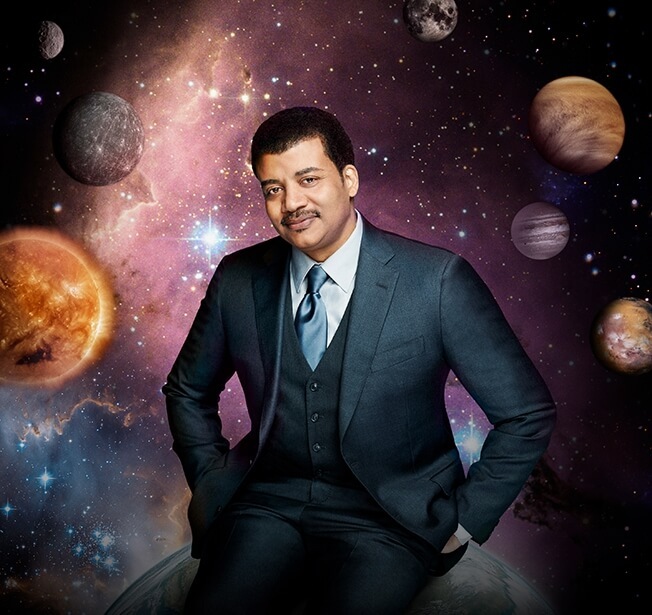 Neil deGrasse Tyson: I look at what temperature it’s going to be on the weather app. I just use the one that comes on the iPhone. I don’t even know what it’s called. There’s a little cloud and a sun on it. [Laughs] Then I look at my calendar to see if I have any interviews I have to dress for. And then I check my email—there are usually hundreds by the time morning comes—and see if there are any fires I need to put out. Also in that email stream will be links to New York Times articles my wife sends me. It takes two of us, primarily her, to read the papers and get me informed. And then I might see if there’s anything abuzz on Twitter. When did you start using Twitter? I joined Twitter in 2009, but I didn’t start using it in the way I currently do until the middle of 2010. When I first joined Twitter, I was tweeting, but sort of like everyone else was tweeting. You know, “I’m crossing the park now” or “I’m eating a hamburger now.” I realized that as an educator and a scientist, I had more power of information than that, and I decided to have my tweets contain information that people might enjoy or be intrigued by or offer a cosmic perspective. And so my tweets since then have been just that. My first thought is, “Is there something I can teach people today?” If not, no tweet goes out. What is it like being the unofficial science teacher of the Twitterverse? Whether or not that’s what people think I am, I view myself a little differently. I try not to comment specifically on current events because often one’s only knowledge of current events is what has been reported by journalists in the news media, and I don’t like my information filtered. So what I will do is take a step back and ask myself whether there is some higher-altitude perspective that I can offer people that will shape how people might think about a news story. For example, I made no mention of the Pope’s encyclical [on Twitter], but I made indirect reference to it. The Pope had commented on climate change, so they went to Paul Ryan to react because he is a well-known Catholic, and he said—I’m paraphrasing—”The Pope should stick to religion and let scientists handle the science.” So I then tweeted, “It is possible for a supreme holy leader to know what he’s talking about in regard to climate change.” [Laughs] I just put it out there. And then I thought I needed more defensiveness, so I added, “The Pope employs a dozen astrophysicists as part of the four century-old Vatican observatory.” Boom. I dipped in and dipped out, and both of those tweets can live independent of any current events though they were inspired by current events. And it’s information that you perhaps didn’t know. Who would be your dream guest for StarTalk? We’d love to have Obama on just to find out what kind of science he’s been thinking about and what he might do when he’s done being president, because ex-presidents have huge power and influence. I know he’s got some science literacy in him, but there just aren’t many occasions for it to come out. We could chill. [Laughs] We could have a geek moment together! Another person I’d like to get is Charlie Sheen. I once had him in my office when he was visiting the [Museum of Natural History], and he spent 30 minutes asking me completely informed questions about the big bang and the early universe and exploding stars and dark matter. I was thinking to myself, “Nobody knows this about this man.” He’s somebody who could occasionally use an infusion of goodwill, and to the extent that he is a geek enthusiast, StarTalk could be just that occasion. So I’ve got him in my sights as well. Are you often surprised by your guests’ scientific knowledge? I used to be surprised if someone who no one associated with science ended up baring their sort of “geek belly” to me. But what it’s much more common than I previously imagined. We just interviewed David Crosby, and you would never know that he was a crazy science fiction buff long before he ever picked up a guitar! I’ve come to now expect that there’s some little bit of hidden geek within people that you might not necessarily know about even if you’re a fan. I watch the fake news, like Larry Wilmore, and I used to avidly watch Jon Stewart when I could. There’s no single program that I have any particular addiction to, though. Key & Peele had a great sketch about you during the show’s last season. What did you think about that? Was the science in the sketch at all accurate? People often accuse me of being a science buzz kill, but what they don’t know—and maybe it’s my fault for not manifesting this visibly enough—is that I have a huge berth through with artists can pass and express artistic freedoms and creativity within science. It derives from an edict from Mark Twain, where he said, “First get your facts straight, then distort them at your leisure.” [Laughs] If you show me you’ve done at least a little bit of homework, from there, you can run with it. So Key & Peele’s Cosmos-ian recitations were laden with abstract words and at some point lost precise meaning, but that’s not the point. The point is that you are drifting out into space as you hear this narrative, and then you realize, “Wow, he’s really thought this through.” But no, it’s not something I would judge for how accurate it was. Not too many books. I’m way, way behind on my reading. I’m reading some Eastern philosophy right now and some Muslim philosophers. I’m reading a history of how people thought about what is and isn’t true in the world. I’m also reading some books that came out recently about how people misthink things, and while I’m already familiar with a lot of that, there’s always something I end up learning. There’s one by Michael Shermer, who is the editor of Skeptic magazine, called The Moral Arc. And there’s a book by Bertrand Russell that I just cracked. It’s called Human Society in Ethics and Politics, written in 1955. What’s interesting about 1955, of course, is that bombs were everywhere—we had just perfected the hydrogen bomb, which makes the A-bomb look like a firecracker—and I like watching how people think about ideas in the presence of what is the prevailing geopolitics. All of those books are nonfiction, in case you were wondering. I save my appetite for fiction for film.